Home Google Fiber What's Happening With Google Fiber? When you're stuck waiting for a video to buffer, it's easy to dream of life with Google Fiber. Imagine how fast Web pages would load on a gigabit fiber optic connection. You would expect the only thing slowing down your Internet would be you choosing which page to load next. However, the people of Kansas City have found that having a gigabit fiber optic connection to the Web can be quite lonely. It turns out that so few people have an Internet connection this fast there are few services designed to take advantage of the speed. For example, streaming an HD show on Netflix will only take up 3.58 Mbps of the 1,000 Mbps you have available on Google Fiber. The servers at Netflix can only process the video at 5 Mbps, and you'll only get that speed if you're watching the video inside their data center. Having one of the fastest Internet connection on the planet is only useful if you can do something with it. This has many people wondering why they need such a fast Internet connection. Given that most services will not offer any performance benefits on a connection over 5 Mbps, why would anyone need a faster service? Well, you have to consider that homes with Internet access in the US also have an average of more than five Internet connected devices per household. Potentially, each of these devices could be streaming content at the same time. The kids could be watching movies on their laptops while their parents are watching their own shows on the TV and a tablet. While all this is happening, other devices on the home network could be downloading updates or synchronizing files to the cloud. While 5 Mbps may be enough speed for one computer streaming one show, you'll need a little extra bandwidth to support all these other devices at the same time. 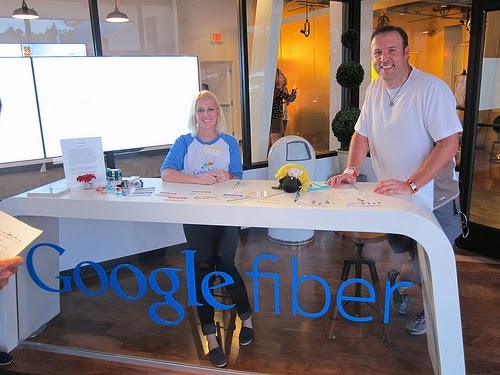 If you're not lucky enough to live in one of the Google Fiber cities, you're not out of luck. Many other providers have begun to offer similar service throughout the U.S. Verizon FiOS in Pittsburgh, Pa. and EPB in Chattanooga, Tenn. are only two of the many options available. More and more fiber optic services are coming online around the world. As more people sign up for these services it will encourage online services to develop their products with these customers in mind. If you've got to have high speed Internet on the go, another option on the horizon is 4G wireless Internet service. It is much easier, and less expensive, to upgrade the existing wired infrastructure in the US than it is to create a new wireless network. For this reason, you can get a faster and less expensive Internet connection if you don't mind wire. When you must have a wireless option, 4G is the way to go. You can expect speeds of 5 – 10 Mbps, but future investments in this technology promise speeds of up to 100 Mbps. However, this is not a real threat to Google Fiber or any other fiber optic Internet service provider at this time. Even if 4G wireless services could achieve their theoretical top speed, they would still fall short of the top speed that a fiber optic connection delivers.